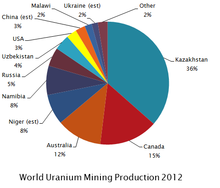 2012 uranium mining, by nation. World Uranium production in 2005. Uranium minerals were noticed by miners for a long time prior to the discovery of uranium in 1789. The uranium mineral pitchblende, also known as uraninite, was reported from the Krušné hory (Ore Mountains), Saxony, as early as 1565. Other early reports of pitchblende date from 1727 in Jáchymov and 1763 in Schwarzwald. In the early 19th century, uranium ore was recovered as a byproduct of mining in Saxony, Bohemia, and Cornwall. The first deliberate mining of radioactive ores took place in Jáchymov, a silver-mining city in the Czech Republic. Marie Curie used pitchblende ore from Jáchymov to isolate the element radium, a decay product of uranium. Until World War II, uranium was mined primarily for its radium content; some carnotite deposits were mined primarily for the vanadium content. Sources for radium, contained in the uranium ore, were sought for use as luminous paint for watch dials and other instruments, as well as for health-related applications, some of which in retrospect were certainly harmful. The byproduct uranium was used mostly as a yellow pigment. In the United States, the first radium/uranium ore was discovered in 1871 in gold mines near Central City, Colorado. This district produced about 50 tons of high grade ore between 1871 and 1895. However, most American uranium ore before World War II came from vanadium deposits on the Colorado Plateau of Utah and Colorado. In Cornwall, the South Terras Mine near St. Stephen opened for uranium production in 1873, and produced about 175 tons of ore before 1900. Other early uranium mining occurred in Autunois in France's Massif Central, Oberpfalz in Bavaria, and Billingen in Sweden. The Shinkolobwe deposit in Katanga, Belgian Congo now Shaba Province, Democratic Republic of the Congo (DRC) was discovered in 1913, and exploited by the Union Minière du Haut Katanga. Other important early deposits include Port Radium, near Great Bear Lake, Canada discovered in 1931, along with Beira Province, Portugal; Tyuya Muyun, Uzbekistan, and Radium Hill, Australia. Because of the need for the uranium for bomb research during World War II, the Manhattan Project used a variety of sources for the element. The Manhattan Project initially purchased uranium ore from the Belgian Congo, through the Union Minière du Haut Katanga. Later the project contracted with vanadium mining companies in the American Southwest. Purchases were also made from the Eldorado Mining and Refining Limited company in Canada. This company had large stocks of uranium as waste from its radium refining activities. American uranium ores mined in Colorado were mixed ores of vanadium and uranium, but because of wartime secrecy, the Manhattan Project would publicly admit only to purchasing the vanadium, and did not pay the uranium miners for the uranium content. In a much later lawsuit, many miners were able to reclaim lost profits from the U.S. government. American ores had much lower uranium concentrations than the ore from the Belgian Congo, but they were pursued vigorously to ensure nuclear self-sufficiency. Similar efforts were undertaken in the Soviet Union, which did not have native stocks of uranium when it started developing its own atomic weapons program. Intensive exploration for uranium started after the end of World War II as a result of the military and civilian demand for uranium. There were three separate periods of uranium exploration or "booms." These were from 1956 to 1960, 1967 to 1971, and from 1976 to 1982. In the 20th century, the United States was the world's largest uranium producer. Grants Uranium District in northwestern New Mexico was the largest United States uranium producer. The Gas Hills Uranium District was the second largest uranium producer. The famous Lucky Mc Mine is located in the Gas Hills near Riverton, Wyoming. Canada has since surpassed the United States as the cumulative largest producer in the world. In 1990, 55% of world production came from underground mines, but this shrank to 33% by 1999. From 2000, new Canadian mines again increased the proportion of underground mining, and with Olympic Dam it is now 37%. In situ leach (ISL, or ISR) mining has been steadily increasing its share of the total, mainly due to Kazakhstan. Many different types of uranium deposits have been discovered and mined. There are mainly three types of uranium deposits including unconformity-type deposits, namely paleoplacer deposits and sandstone-type also known as roll front type deposits. Uranium deposits are classified into 15 categories according to their geological setting and the type of rock in which they are found. This geological classification system is determined by the International Atomic Energy Agency (IAEA). The Mi Vida uranium mine, near Moab, Utah. Note alternating red and white/green sandstone. This type of uranium deposit is easier and cheaper to mine than the other types because the uranium is found not far from the surface of the crust. Uranium deposits in sedimentary rocks include those in sandstone (in Canada and the western US), Precambrian unconformities (in Canada), phosphate, Precambrian quartz-pebble conglomerate, collapse breccia pipes (see Arizona breccia pipe uranium mineralization), and calcrete. Sandstone uranium deposits are generally of two types. Roll-front type deposits occur at the boundary between the up dip and oxidized part of a sandstone body and the deeper down dip reduced part of a sandstone body. Peneconcordant sandstone uranium deposits, also called Colorado Plateau-type deposits, most often occur within generally oxidized sandstone bodies, often in localized reduced zones, such as in association with carbonized wood in the sandstone. Precambrian quartz-pebble conglomerate-type uranium deposits occur only in rocks older than two billion years old. The conglomerates also contain pyrite. These deposits have been mined in the Blind River-Elliot Lake district of Ontario, Canada, and from the gold-bearing Witwatersrand conglomerates of South Africa. Unconformity-type deposits make up about 33% of the World Outside Centrally Planned Economies Areas (WOCA)'s uranium deposits. Hydrothermal uranium deposits encompass the vein-type uranium ores. Igneous deposits include nepheline syenite intrusives at Ilimaussaq, Greenland; the disseminated uranium deposit at Rossing, Namibia; and uranium-bearing pegmatites. Disseminated deposits are also found in the states of Washington and Alaska in the US. Breccial uranium deposits are found in rocks that have been broken due to tectonic fracturing, or weathering. Breccia uranium deposits are most common in India, Australia and the United States. Olympic Dam mine is the world's largest uranium deposit and home to the Olympic Dam Centre, a mining company currently owned by BHP Billiton. Uranium prospecting is similar to other forms of mineral exploration with the exception of some specialized instruments for detecting the presence of radioactive isotopes. The Geiger counter was the original radiation detector, recording the total count rate from all energy levels of radiation. Ionization chambers and Geiger counters were first adapted for field use in the 1930s. The first transportable Geiger–Müller counter (weighing 25 kg) was constructed at the University of British Columbia in 1932. H.V. Ellsworth of the GSC built a lighter weight, more practical unit in 1934. Subsequent models were the principal instruments used for uranium prospecting for many years, until geiger counters were replaced by scintillation counters. The use of airborne detectors to prospect for radioactive minerals was first proposed by G.C. Ridland, a geophysicist working at Port Radium in 1943. In 1947, the earliest recorded trial of airborne radiation detectors (ionization chambers and Geiger counters) was conducted by Eldorado Mining and Refining Limited. (a Canadian Crown Corporation since sold to become Cameco Corporation). The first patent for a portable gamma-ray spectrometer was filed by Professors Pringle, Roulston & Brownell of the University of Manitoba in 1949, the same year as they tested the first portable scintillation counter on the ground and in the air in northern Saskatchewan. Airborne gamma-ray spectrometry is now the accepted leading technique for uranium prospecting with worldwide applications for geological mapping, mineral exploration & environmental monitoring. Airborne gamma-ray spectrometry used specifically for uranium measurement and prospecting must account for a number of factors like the distance between the source and the detector and the scattering of radiation through the minerals, surrounding earth and even in the air. In Australia, a Weathering Intensity Index has been developed to help prospectors based on the Shuttle Radar Topography Mission (SRTM) elevation and airborne gamma-ray spectrometry images. A deposit of uranium, discovered by geophysical techniques, is evaluated and sampled to determine the amounts of uranium materials that are extractable at specified costs from the deposit. Uranium reserves are the amounts of ore that are estimated to be recoverable at stated costs. As with other types of hard rock mining there are several methods of extraction. In 2012, the percentage of the mined uranium produced by each mining method was: in-situ leach (44.9 percent), underground mining (26.2 percent), open pit (19.9 percent), and heap leaching (1.7 percent). The remaining 7.3% was derived as a byproduct of mining for other minerals, and miscellaneous recovery. In open pit mining, overburden is removed by drilling and blasting to expose the ore body, which is then mined by blasting and excavation using loaders and dump trucks. Workers spend much time in enclosed cabins thus limiting exposure to radiation. Water is extensively used to suppress airborne dust levels. If the uranium is too far below the surface for open pit mining, an underground mine might be used with tunnels and shafts dug to access and remove uranium ore. There is less waste material removed from underground mines than open pit mines, however this type of mining exposes underground workers to the highest levels of radon gas. Underground uranium mining is in principle no different from any other hard rock mining and other ores are often mined in association (e.g., copper, gold, silver). Once the ore body has been identified a shaft is sunk in the vicinity of the ore veins, and crosscuts are driven horizontally to the veins at various levels, usually every 100 to 150 metres. Similar tunnels, known as drifts, are driven along the ore veins from the crosscut. To extract the ore, the next step is to drive tunnels, known as raises when driven upwards and winzes when driven downwards, through the deposit from level to level. Raises are subsequently used to develop the stopes where the ore is mined from the veins. The stope, which is the workshop of the mine, is the excavation from which the ore is extracted. Two methods of stope mining are commonly used. In the "cut and fill" or open stoping method, the space remaining following removal of ore after blasting is filled with waste rock and cement. In the "shrinkage" method, only sufficient broken ore is removed via the chutes below to allow miners working from the top of the pile to drill and blast the next layer to be broken off, eventually leaving a large hole. Another method, known as room and pillar, is used for thinner, flatter ore bodies. In this method the ore body is first divided into blocks by intersecting drives, removing ore while so doing, and then systematically removing the blocks, leaving enough ore for roof support. With regulations in place to ensure the use of high volume ventilation technology if any confined space uranium mining is occurring, occupational exposure and mining deaths can be largely eliminated. The Olympic Dam and Canadian underground mines are ventilated with powerful fans with radon levels being kept at a very low to practically "safe level" in uranium mines. Naturally occurring radon in other, non-uranium mines, also may need control by ventilation. Heap leaching is an extraction process by which chemicals (usually sulfuric acid) are used to extract the economic element from ore which has been mined and placed in piles on the surface. Heap leaching is generally economically feasible only for oxide ore deposits. Oxidation of sulfide deposits occurs during the geological process called weathering. Therefore, oxide ore deposits are typically found close to the surface. If there are no other economic elements within the ore a mine might choose to extract the uranium using a leaching agent, usually a low molar sulfuric acid. If the economic and geological conditions are right, the mining company will level large areas of land with a small gradient, layering it with thick plastic (usually HDPE or LLDPE), sometimes with clay, silt or sand beneath the plastic liner. The extracted ore will typically be run through a crusher and placed in heaps atop the plastic. The leaching agent will then be sprayed on the ore for 30–90 days. As the leaching agent filters through the heap the uranium will break its bonds with the oxide rock and enter the solution. The solution will then filter along the gradient into collecting pools which will then be pumped to on-site plants for further processing. Only some of the uranium (commonly about 70%) is actually extracted. The uranium concentrations within the solution are very important for the efficient separation of pure uranium from the acid. As different heaps will yield different concentrations the solution is pumped to a mixing plant that is carefully monitored. The properly balanced solution is then pumped into a processing plant where the Uranium is separated from the sulfuric acid. Heap leach is significantly cheaper than traditional milling processes. The low costs allow for lower grade ore to be economically feasible (given that it is the right type of ore body). Environmental law requires that the surrounding ground water is continually monitored for possible contamination. The mine will also have to have continued monitoring even after the shutdown of the mine. In the past mining companies would sometimes go bankrupt, leaving the responsibility of mine reclamation to the public. Recent additions to the mining law require that companies set aside the money for reclamation before the beginning of the project. The money will be held by the public to insure adherence to environmental standards if the company were to ever go bankrupt. Another very similar mining technique is called in situ, or in place mining where the ore doesn't even need extracting. In-situ leaching (ISL), also known as solution mining, or in-situ recovery (ISR) in North America, involves leaving the ore where it is in the ground, and recovering the minerals from it by dissolving them and pumping the pregnant solution to the surface where the minerals can be recovered. Consequently, there is little surface disturbance and no tailings or waste rock generated. However, the orebody needs to be permeable to the liquids used, and located so that they do not contaminate ground water away from the orebody. Uranium ISL uses the native groundwater in the orebody which is fortified with a complexing agent and in most cases an oxidant. It is then pumped through the underground orebody to recover the minerals in it by leaching. Once the pregnant solution is returned to the surface, the uranium is recovered in much the same way as in any other uranium plant (mill). In Australian ISL mines (Beverley, Four Mile and Honeymoon Mine) the oxidant used is hydrogen peroxide and the complexing agent sulfuric acid. Kazakh ISL mines generally do not employ an oxidant but use much higher acid concentrations in the circulating solutions. ISL mines in the USA use an alkali leach due to the presence of significant quantities of acid-consuming minerals such as gypsum and limestone in the host aquifers. Any more than a few percent carbonate minerals means that alkali leach must be used in preference to the more efficient acid leach. The Australian government has published a best practice guide for in situ leach mining of uranium, which is being revised to take account of international differences. The uranium concentration of sea water is low, approximately 3.3 parts per billion or 3.3 micrograms per liter of seawater. But the quantity of this resource is gigantic and some scientists believe this resource is practically limitless with respect to world-wide demand. That is to say, if even a portion of the uranium in seawater could be used the entire world's nuclear power generation fuel could be provided over a long time period. Some anti-nuclear proponents claim this statistic is exaggerated. Although research and development for recovery of this low-concentration element by inorganic adsorbents such as titanium oxide compounds has occurred since the 1960s in the United Kingdom, France, Germany, and Japan, this research was halted due to low recovery efficiency. At the Takasaki Radiation Chemistry Research Establishment of the Japan Atomic Energy Research Institute (JAERI Takasaki Research Establishment), research and development has continued culminating in the production of adsorbent by irradiation of polymer fiber. Adsorbents have been synthesized that have a functional group (amidoxime group) that selectively adsorbs heavy metals, and the performance of such adsorbents has been improved. Uranium adsorption capacity of the polymer fiber adsorbent is high, approximately tenfold greater in comparison to the conventional titanium oxide adsorbent. One method of extracting uranium from seawater is using a uranium-specific nonwoven fabric as an adsorbent. The total amount of uranium recovered from three collection boxes containing 350 kg of fabric was >1 kg of yellowcake after 240 days of submersion in the ocean. According to the OECD, uranium may be extracted from seawater using this method for about $300/kg-U. The experiment by Seko et al. was repeated by Tamada et al. in 2006. They found that the cost varied from ¥15,000 to ¥88,000 depending on assumptions and "The lowest cost attainable now is ¥25,000 with 4g-U/kg-adsorbent used in the sea area of Okinawa, with 18 repetitionuses [sic]." With the May, 2008 exchange rate, this was about $240/kg-U. In 2012, ORNL researchers announced the successful development of a new adsorbent material dubbed "HiCap", which vastly outperforms previous best adsorbents, which perform surface retention of solid or gas molecules, atoms or ions. "We have shown that our adsorbents can extract five to seven times more uranium at uptake rates seven times faster than the world's best adsorbents," said Chris Janke, one of the inventors and a member of ORNL's Materials Science and Technology Division. HiCap also effectively removes toxic metals from water, according to results verified by researchers at Pacific Northwest National Laboratory. Since 1981 uranium prices and quantities in the US are reported by the Department of Energy. The import price dropped from 32.90 US$/lb-U3O8 in 1981 down to 12.55 in 1990 and to below 10 US$/lb-U3O8 in the year 2000. Prices paid for uranium during the 1970s were higher, 43 US$/lb-U3O8 is reported as the selling price for Australian uranium in 1978 by the Nuclear Information Centre. Uranium prices reached an all-time low in 2001, costing US$7/lb, but in April 2007 the price of Uranium on the spot market rose to US$113.00/lb, a high point of the uranium bubble of 2007. This was very close to the all time high (adjusted for inflation) in 1977. As of July 2014, the price of uranium concentrate remained near a five-year low, the uranium price having fallen more than 50% from the peak spot price in January 2011, reflecting the loss of Japanese demand following the 2011 Fukushima nuclear disaster. As a result of continued low prices, in February 2014 mining company Cameco deferred plans to expand production from existing Canadian mines, although it continued work to open a new mine at Cigar Lake. Also in February 2014, Paladin energy suspended operations at its mine in Malawi, saying that the high-cost operation was losing money at current prices. In the beginning of the Cold War, to ensure adequate supplies of uranium for national defense, the United States Congress passed the U.S. Atomic Energy Act of 1946, creating the Atomic Energy Commission (AEC) which had the power to withdraw prospective uranium mining land from public purchase, and also to manipulate the price of uranium to meet national needs. By setting a high price for uranium ore, the AEC created a uranium "boom" in the early 1950s, which attracted many prospectors to the Four Corners region of the country. Moab, Utah became known as the Uranium-capital of the world, when geologist Charles Steen discovered such an ore in 1952, even though American ore sources were considerably less potent than those in the Belgian Congo or South Africa. In the 1950s methods for extracting diluted uranium and thorium, found in abundance in granite or seawater, were pursued. Scientists speculated that, used in a breeder reactor, these materials would potentially provide limitless source of energy. American military requirements declined in the 1960s, and the government completed its uranium procurement program by the end of 1970. Simultaneously, a new market emerged: commercial nuclear power plants. However, in the U.S. this market virtually collapsed by the end of the 1970s as a result of industrial strains caused by the energy crisis, popular opposition, and finally the Three Mile Island nuclear accident in 1979, all of which led to a de facto moratorium on the development of new nuclear reactor power stations. In Europe a mixed situation exists. Considerable nuclear power capacities have been developed, notably in Belgium, Finland, France, Germany, Spain, Sweden, Switzerland, and the UK. In many countries development of nuclear power has been stopped and phased out by legal actions. In Italy the use of nuclear power was barred by a referendum in 1987; however, this is now under revision. Ireland in 2008 also had no plans to change its non-nuclear stance, although since the opening in 2012 of the East-West Interconnector between Ireland and Britain, it has been supported by British nuclear power. The years 1976 and 1977 saw uranium mining become a major political issue in Australia, with the Ranger Inquiry (Fox) report opening up a public debate about uranium mining. The Movement Against Uranium Mining group was formed in 1976, and many protests and demonstrations against uranium mining were held. Concerns relate to the health risks and environmental damage from uranium mining. Notable Australian anti-uranium activists have included Kevin Buzzacott, Jacqui Katona, Yvonne Margarula, and Jillian Marsh. The World Uranium Hearing was held in Salzburg, Austria in September 1992. Anti-nuclear speakers from all continents, including indigenous speakers and scientists, testified to the health and environmental problems of uranium mining and processing, nuclear power, nuclear weapons, nuclear tests, and radioactive waste disposal. People who spoke at the 1992 Hearing include: Thomas Banyacya, Katsumi Furitsu, Manuel Pino and Floyd Red Crow Westerman. They highlighted the threat of radioactive contamination to all peoples, especially indigenous communities and said that their survival requires self-determination and emphasis on spiritual and cultural values. Increased renewable energy commercialization was advocated. Uranium ore emits radon gas. The health effects of high exposure to radon are a particular problem in the mining of uranium; significant excess lung cancer deaths have been identified in epidemiological studies of uranium miners employed in the 1940s and 1950s. The first major studies with radon and health occurred in the context of uranium mining, first in the Joachimsthal region of Bohemia and then in the Southwestern United States during the early Cold War. Because radon is a product of the radioactive decay of uranium, underground uranium mines may have high concentrations of radon. Many uranium miners in the Four Corners region contracted lung cancer and other pathologies as a result of high levels of exposure to radon in the mid-1950s. The increased incidence of lung cancer was particularly pronounced among Native American and Mormon miners, because those groups normally have low rates of lung cancer. Safety standards requiring expensive ventilation were not widely implemented or policed during this period. In studies of uranium miners, workers exposed to radon levels of 50 to 150 picocuries of radon per liter of air (2000–6000 Bq/m3) for about 10 years have shown an increased frequency of lung cancer. Statistically significant excesses in lung cancer deaths were present after cumulative exposures of less than 50 WLM. There is, however, unexplained heterogeneity in these results (whose confidence interval do not always overlap). The size of the radon-related increase in lung cancer risk varied by more than an order of magnitude between the different studies. Since that time, ventilation and other measures have been used to reduce radon levels in most affected mines that continue to operate. In recent years, the average annual exposure of uranium miners has fallen to levels similar to the concentrations inhaled in some homes. This has reduced the risk of occupationally induced cancer from radon, although it still remains an issue both for those who are currently employed in affected mines and for those who have been employed in the past. The power to detect any excess risks in miners nowadays is likely to be small, exposures being much smaller than in the early years of mining. Despite efforts made in cleaning up uranium sites, significant problems stemming from the legacy of uranium development still exist today on the Navajo Nation and in the states of Utah, Colorado, New Mexico, and Arizona. Hundreds of abandoned mines have not been cleaned up and present environmental and health risks in many communities. At the request of the U.S. House Committee on Oversight and Government Reform in October 2007, and in consultation with the Navajo Nation, the Environmental Protection Agency (EPA), along with the Bureau of Indian Affairs (BIA), the Nuclear Regulatory Commission (NRC), the Department of Energy (DOE), and the Indian Health Service (IHS), developed a coordinated Five-Year Plan to address uranium contamination. Similar interagency coordination efforts are beginning in the State of New Mexico as well. In 1978, Congress passed the Uranium Mill Tailings Radiation Control Act (UMTRCA), a measure designed to assist in the cleanup of 22 inactive ore-processing sites throughout the southwest. This also included constructing 19 disposal sites for the tailings, which contain a total of 40 million cubic yards of low-level radioactive material. The Environmental Protection Agency estimates that there are 4000 mines with documented uranium production, and another 15,000 locations with uranium occurrences in 14 western states, most found in the Four Corners area and Wyoming. The Uranium Mill Tailings Radiation Control Act is a United States environmental law that amended the Atomic Energy Act of 1954 and gave the Environmental Protection Agency the authority to establish health and environmental standards for the stabilization, restoration, and disposal of uranium mill waste. Title 1 of the Act required the EPA to set environmental protection standards consistent with the Resource Conservation and Recovery Act, including groundwater protection limits; the Department of Energy to implement EPA standards and provide perpetual care for some sites; and the Nuclear Regulatory Commission to review cleanups and license sites to states or the DOE for perpetual care. Title 1 established a uranium mill remedial action program jointly funded by the federal government and the state. Title 1 of the Act also designated 22 inactive uranium mill sites for remediation, resulting in the containment of 40 million cubic yards of low-level radioactive material in UMTRCA Title 1 holding cells. ^ a b "World Uranium Mining Production". World Nuclear Association. Retrieved 2014-05-15. ^ Franz J. Dahlkamp, Uranium ore deposits, Springer-Verlag, Berlin, 1993, 460 p., ISBN��3-540-53264-1. ^ "World Uranium Mining Production". World Uranium Association. July 2013. Retrieved 2013-11-19. ^ "Geology of Uranium Deposits - World Nuclear Association". www.world-nuclear.org. Retrieved 2016-07-21. ^ a b c d Chaki, Sanjib; Foutes, Elliot; Ghose, Shankar; Littleton, Brian; Mackinney, John; Schultheisz, Daniel; Schuknecht, Mark; Setlow, Loren; Shroff, Behram (January 2006). Technologically Enhanced Naturally Occurring Radioactive Materials From Uranium Mining (PDF). 1: "Mining and Reclamation Background". Washington, D.C.: US Environmental Protection Agency Office of Radiation and Indoor Air Radiation Protection Division. pp. 1–8 to 1–9. ^ "uranium deposits". earthsci.org. Archived from the original on 2016-09-03. Retrieved 2016-07-21. ^ "Uranium: Where Is It?". geoinfo.nmt.edu. Retrieved 2016-07-21. ^ "Olympic Dam Copper-Uranium Mine, Adelaide". Mining Technology. Retrieved 2016-07-21. ^ Wilford, John (2012-08-01). "A weathering intensity index for the Australian continent using airborne gamma-ray spectrometry and digital terrain analysis". Geoderma. 183–184: 124–142. doi:10.1016/j.geoderma.2010.12.022. ^ Uranium 2014, International Atomic Energy Agency/OCED Nuclear Energy Agency, 2014, p.69. ^ "New Radon Emission Standards for U.S. Underground Uranium Mines". onemine.org. Archived from the original on 2013-04-15. ^ "There are radiation protection standards in place specifically to protect uranium mine workers". epa.gov. ^ "In Situ Leach Mining (ISL) of Uranium". World-nuclear.org. Retrieved 2013-07-26. ^ "Nuclear power - the energy balance" (PDF). October 2007. Section D10. Archived from the original (PDF) on November 22, 2008. Retrieved 2016-03-31. ^ Noriaki Seko; Akio Katakai; Shin Hasegawa; Masao Tamada; Noboru Kasai; Hayato Takeda; Takanobu Sugo; Kyoichi Saito (November 2003). "Aquaculture of Uranium in Seawater by a Fabric-Adsorbent Submerged System". Nuclear Technology. 144 (2). Retrieved 2008-04-30. ^ "Uranium Resources 2003: Resources, Production and Demand" (PDF). OECD World Nuclear Agency and International Atomic Energy Agency. March 2008. p. 22. Archived from the original (PDF) on 2009-03-20. Retrieved 2008-04-23. ^ Tamada M, et al. (2006). "Cost Estimation of Uranium Recovery from Seawater with System of Braid type Adsorbent". —. 5 (4): 358–363. Archived from the original on 2008-06-12. Retrieved 2008-05-10. ^ "Official website for DOE Project Extraction of Uranium from Seawater". Web.ornl.gov. 2012-06-08. Archived from the original on 2015-12-10. Retrieved 2013-07-26. ^ "Oak Ridge National Laboratory - ORNL technology moves scientists closer to extracting uranium from seawater". Ornl.gov. 2012-08-21. Archived from the original on 2012-08-25. Retrieved 2013-07-26. ^ "PNNL: News - Fueling nuclear power with seawater". Pnnl.gov. 2012-08-21. Retrieved 2013-07-26. ^ "Table S1: Uranium Purchased by Owners and Operators of U.S. Civilian Nuclear Power Reactors". Uranium Marketing Annual Report. Energy Information Administration, U.S. DoE. May 16, 2007. Retrieved 2008-05-10. ^ "Section 9: Nuclear Energy" (PDF). Energy Information Administration, U.S. DoE. Retrieved 2008-05-10. ^ Seccombe, Allan (24 April 2007). "Uranium prices will correct soon". Miningmx.com. Archived from the original on 2007-09-28. Retrieved 2008-05-10. ^ "Constant 2007 US$ vs. Current US$ Spot U3O8 Prices". Ux Consulting Company, LLC. Archived from the original on 2008-06-10. Retrieved 2008-05-10. ^ Dave Sweeney (January 14, 2014). "Uranium: Undermining Africa". Australian Conservation Foundation Online. Archived from the original on 2014-04-13. Retrieved 2014-04-13. ^ Cameco, Uranium 5-year spot price history Archived 2014-09-07 at the Wayback Machine, accessed 7 Sept. 2014. ^ Nickel, Rod (7 February 2014). "Uranium producer Cameco scraps production target". Reuters. Retrieved 17 April 2014. ^ Komnenic, Ana (7 February 2014). "Paladin Energy suspends production at Malawi uranium mine". Mining.com. Retrieved 17 April 2014. ^ "Chapter 4: Olympian Feats". Oak Ridge National Laboratory Review. Oak Ridge National Laboratory, U.S. Dept. of Energy. Retrieved 2008-05-10. ^ Rosenthal, Elisabeth (May 23, 2008). "Italy Embraces Nuclear Power". The New York Times. Retrieved 2008-05-22. ^ Department of Communications, Marine and Natural Resources (2007) [2007-03-12]. "Section 3. The Policy Framework." (PDF). Delivering A Sustainable Energy Future For Ireland. The Energy Policy Framework 2007-2020. Dublin: Department of Communications, Marine and Natural Resources. p. 25. ISBN 978-0-7557-7521-7. Archived from the original (PDF) on 2010-12-23. Retrieved 2008-08-07. 3.4.2. The Government will maintain the statutory prohibition on nuclear generation in Ireland. The Government believes that for reasons of security, safety, economic feasibility and system operation, nuclear generation is not an appropriate choice for this country. The Government will continue to articulate its strong position in relation to nuclear generation and transboundary safety concerns in Europe in the context of the EU Energy Strategy. Developments in relation to nuclear generation in the UK and other Member States will be closely monitored in terms of implications for Ireland. ^ "That nukes that argument". irishexaminer.com. 2013-06-06. ^ "DCENR Green Paper on Energy Policy in Ireland See Page 50" (PDF). dcenr.gov.ie. Archived from the original (PDF) on 2014-07-21. Retrieved 2014-07-21. ^ Nuclear-Free Future Award. "World Uranium Hearing, a Look Back". Archived from the original on 2013-06-03. Retrieved 2013-09-05. ^ Nuclear-Free Future Award. "The Declaration of Salzberg". Archived from the original on 2012-09-23. Retrieved 2013-09-05. ^ Roscoe, R. J.; Deddens, J. A.; Salvan, A.; Schnorr, T. M. (1995). "Mortality among Navajo uranium miners". American Journal of Public Health. 85 (4): 535–40. doi:10.2105/AJPH.85.4.535. PMC 1615135. PMID 7702118. ^ a b Toxological profile for radon, Agency for Toxic Substances and Disease Registry, U.S. Public Health Service, In collaboration with U.S. Environmental Protection Agency, December 1990. ^ "EPA Assessment of Risks from Radon in Homes" (PDF). Office of Radiation and Indoor Air, US Environmental Protection Agency. June 2003. ^ a b Darby, S; Hill, D; Doll, R (2005). "Radon: a likely carcinogen at all exposures". Ann. Oncol. 12 (10): 1341–51. doi:10.1023/A:1012518223463. PMID 11762803. ^ "Now is the time for homeowners to be concerned about Radon". radon-pennsylvania. ^ "Department of Energy, "UMTRCA Title I Disposal and Processing Sites" Regulatory Framework. 19 July 2012. Web. 5 December 2012". lm.doe.gov. ^ "U.S. EPA, Radiation Protection, "Uranium Mining Waste" 30 August 2012 Web.4 December 2012". epa.gov. 2014-07-16. ^ "Uranium Mining and Extraction Processes in the United States Figure 2.1. Mines and Other Locations with Uranium in the Western U.S." (PDF). epa.gov. 2014-07-16. Health Impacts for Uranium Mine and Mill Residents - Science Issues. Uranium mining left a legacy of death.